Glidermatic doors require an extra 20mm side clearance on the side the drive unit is required to be fitted. The diagrams show the relation of Gliderol doors to the horizontal and vertical brick opening. 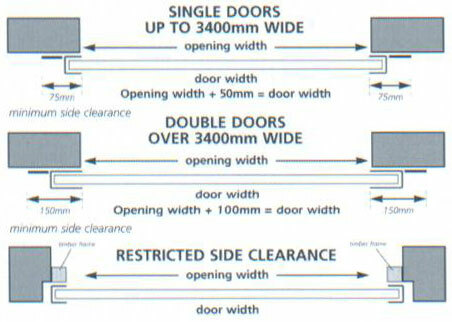 Please note that many more widths of doors are available than shown in the drawing. The windlock System should be specified for double doors in very exposed locations. In these instances, greater side room clearance is required. For advice and information, speak to Gliderol's technical department or your local supplier.